I never met Mamá Adela, my paternal grandmother. She died in the sixties from breast cancer, when my dad was still a priest. From the stories my Tio Germán tells me, my dad was in Chile when he received word of my grandmother’s declining health. He asked the Church, and was granted, a transfer back to Manizales, where he spent his time by her side. Like my dad, she smoked cigarettes until the end. My dad often told me how he’d sneak some to her, a last gusto, because at that state, why deny her simple pleasures? Perhaps smoking was a comfort for her, a tool to embrace a death that was hers. 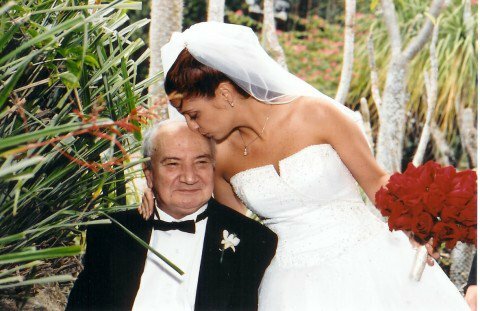 Her husband, my grandfather, had died ten years earlier in a motorcycle accident. He was too young. Maybe she saw her sentence as a way of seeing him once more. Maybe she’d missed him, especially since the children were all grown. Or maybe she shuddered at the thought of being bound again, in the afterlife. I don’t think the latter holds true to her memory, though. In the picture I have of her, tacked on a collage on my living room wall, she is still young. She’s sitting, staring off to the side, her hair a neat, dark bob, her thin lips in a line. No smile. I don’t think it was customary to smile in those days, but I wonder if she had other reasons not to smile. The photograph is circa 1934 and four of her six children are pictured; the final two would follow in the years to come. My dad, the youngest here, was about four or five. Germán, the oldest, must have been about eight. 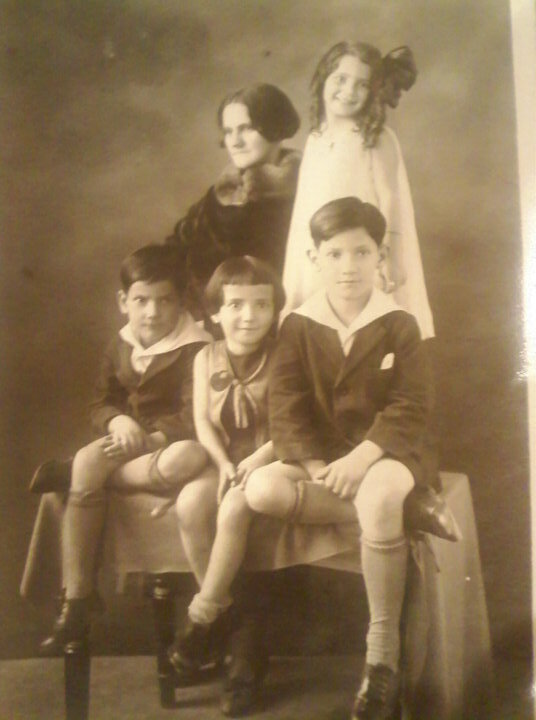 In the photograph, Ruth is standing next to my grandmother, behind the three sitting boys: Rodrigo, my dad, and Germán. The only ones smiling are my dad and Tia Ruth. Tio Rodrigo’s lips are also in a straight line, his eyebrows scrunched; Tio Germán doesn’t scowl nor does he smile. When I was a child, I loved this photograph because it’s the only photo of my dad as a child. All I have of my dad’s youth are stories. This is one, tangible proof that he was, in fact, a child – funny haircut and bright, wide eyes and all. I wonder what my grandmother felt, sitting beside her children. Did she feel divided? Did she care that she had no choices? I wonder if that’s why she didn’t smile, why she bore her cross, that woman born with the century, without complaining but without smiling. I look at her and want to know her, understand her, as if that is the key to understanding part of who I am. I ask Tio Germán, the eldest of her children and now well into his eighties, about her and he tells me stories of her my father never did. She had poor health, unidentifiable pains the doctors couldn’t name, so they sent her to Aguadas, a valley near Manizales that provided much-needed warmth for her aches; Manizales was just too cold. She went to Aguadas with my dad whenabout six or seven, while my uncle stayed behind with my grandfather. I don’t know how the others were divided, but I wonder whether my grandmother yearned for that solitude, for that brief period of independence. The stories I’ve heard of her are conflicting. My dad referred to her as docile, sweet; my cousins, the ones that met her, remember her as stoic, stern, and the one who punished. In this photograph, I can see traces of both women. My mother and I used to play Parques, much like the American Parcheesi, but the Colombian version. Mom and I would sit cross legged on our sofa and begin the game. This is back when I wasn’t a teenage yet and my mom still had energy and hadn’t been dragged down by my dad’s illnesses. We were happy then, and we laughed. The games would happen sometimes during the week nights, but more often than not, our Parques game night happened on Saturday nights, after dinner, and while we watched Sabado Gigante back when it was still somewhat decent and women were three-quarters clothes (as opposed to the now three-quarters naked women pushing their Latin sexuality on the audiences). Dad never played; this was Mom’s and my game. I would go to the closet and bring out the box with the vibrant greens, yellows, reds and blues. Mom would sit on the sofa, trimming her cuticles while she waited. I’d set up the game and chose the color – Mom would always let me choose the color – and then we’d start. I won often, and sometimes I think she’d let me win. We would talk and laugh and enjoy that time. Then Dad stopped sleeping and started taking some sleeping pills sent from Colombia. Our games stopped around then. We were in the 2-bedroom apartment with the den. My godparents had died in the 1990 plane crash in New York, and we had left Westchester for good. I was a new face, with glasses and braces, in a new school, secluded to my studies. That’s when Dad started breaking more glasses, and when the screaming became ordinary. My mom and I would go walking now; no more Parques games because something would set my dad off and the board would fly, the game pieces would get lost, and my mom would cry.